The potential to develop "materials that compute" (AKA computronium) has taken another leap with engineers demonstrating a material that can be designed to recognize simple patterns. This responsive, hybrid material, powered by its own chemical reactions, could one day be integrated into clothing and used to monitor the human body, or developed as a skin for "squishy" robots. Published under the title "Pattern recognition for materials that compute" in the AAAS journal Science Advances, this represents the continued research of Anna C. Balazs, professor of chemical and petroleum engineering, and Steven P. Levitan, professor of electrical and computer engineering, both at the University of Pittsburgh. Co-investigators include Yan Fang, lead author and graduate student researcher in the department of electrical and computer engineering; and Victor V. Yashin, research assistant professor of chemical and petroleum engineering. The computations were modeled utilizing Belousov-Zhabotinsky (BZ) gels, a substance that oscillates in the absence of external stimuli, with an overlaying piezoelectric (PZ) cantilever. These so-called BZ-PZ units combine Dr. Balazs' research in BZ gels and Dr. Levitan's expertise in computational modeling and oscillator-based computing systems. "BZ-PZ computations are not digital, like most people are familiar with, and so to recognize something like a blurred pattern within an image requires nonconventional computing," Balazs explained. "For the first time, we have been able to show how these materials would perform the computations for pattern recognition." Levitan and Fang first stored a pattern of numbers as a set of polarities in the BZ-PZ units. The input patterns are coded through the initial phase of the oscillations imposed on these units. 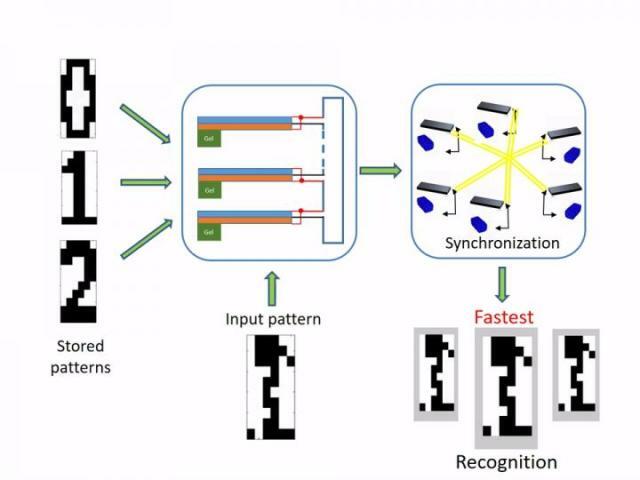 The computational modeling revealed that the input pattern closest to the stored pattern exhibits the fastest convergence time to the stable synchronization behavior and is the most effective at recognizing patterns. In this study, the materials were programmed to recognize black-and-white pixels in the shape of numbers that had been distorted. Compared to a traditional computer, these computations are slow and take minutes. However, Yashin noted that the results are similar to nature, which moves at a "snail's pace." "Individual events are slow because the period of the BZ oscillations is slow," Yashin said. "However, there are some tasks that need a longer analysis and are more natural in function. That's why this type of system is perfect to monitor environments like the human body." For example, Yashin said that patients recovering from a hand injury could wear a glove that monitors movement and informs doctors whether the hand is healing properly or if the patient has improved mobility. Another use would be to monitor individuals at risk for early onset Alzheimer's, by wearing footwear that would analyze gait and compare results against normal movements, or a garment that monitors cardiovascular activity for people at risk of heart disease or stroke. Since the devices convert chemical reactions to electrical energy, there would be no need for external electrical power. This would also be ideal for a robot or other device that could utilize the material as a sensory skin. "Our next goal is to expand from analyzing black-and-white pixels to grayscale and more complicated images and shapes, as well as to enhance the devices storage capability," Fang said. "This was an exciting step for us and reveals that the concept of "materials that compute" is viable." "As computing performance technology is approaching the end of Moore's law growth, the demands and nature of computing are themselves evolving," noted Sankar Basu, program director of the National Science Foundation, which funded the research. "This work at the University of Pittsburgh, supported by the NSF, is an example of this groundbreaking shift away from traditional silicon CMOS-based digital computing to a non-von Neumann machine in a polymer substrate, with remarkable low power consumption. The project is a rare example of much needed interdisciplinary collaboration between material scientists and computer architects." For another example of unconventional computing, find out how engineers program human cells to record analog memories.